Leading Wholesale Distributor of wooden flooring from Ahmedabad. A beautiful rustic floor with wider 5" planks and unique hickory character creates a sense of casual elegance and traditional charm. 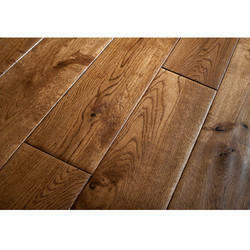 Pergo American Era(TM) is gorgeous solid hardwood that lasts-up to 5 times more durable than ordinary hardwood floors! Floors stay newer longer; resist stains, scuffs and micro-scratches. Even nail polish, permanent marker, glue and paint will not penetrate the surface. Pergo American Era gives you both, design and durability. Results based on average of 10 random scores for each like product tested and in accordance with principles of the ASTM D 4060. Tests conducted on similar products using S-42 abrasive strips affixed to S-32 rubber wheels and changed every 500 cycles and between sample change-overs. Each wheel was loaded with a 500 gram weight (Q4 2013).